Awesome DVD, Must have for anyone who has an STI and does not now enough to strip and put back to gather. Well done STI please keep up the good work. Home Targets Media Various IPSC DVDs Other This is STI! 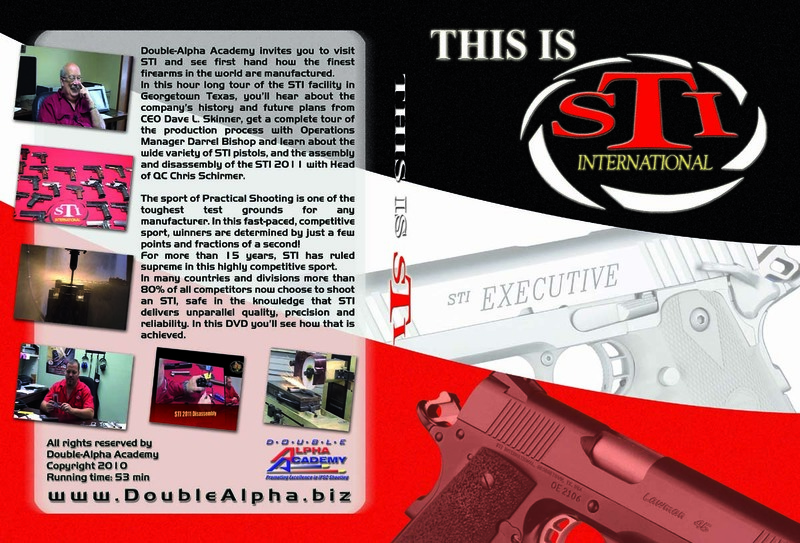 Double-Alpha Academy invites you to visit STI and see first hand how the finest firearms in the world are manufactured. In this hour long tour of the STI facility in Georgetown Texas, you’ll hear about the company’s history and future plans from CEO Dave L. Skinner, get a complete tour of the production process with Operations Manager Darrel Bishop and learn about the wide variety of STI pistols, and the assembly and disassemble of the STI 2011 with Head of QC Chris Schirmer. The sport of IPSC Practical Shooting is one of the toughest test grounds for any manufacturer. In this fast-paced, competitive sport, winners are determined by just a few points and fractions of a second! For more than 15 years, STI has ruled supreme in this highly competitive sport - IPSC. In many countries and divisions more than 80% of all competitors now choose to shoot an STI, safe in the knowledge that STI delivers unparalleled quality, precision and reliability. In this DVD you’ll see how that is achieved.